Samantha Elliott‎ Random photos and observations from the Cape Fear show. Samantha Elliott Money shot. Discuss! John Womack I think he means that as you go up to the top of the “teepee” if those top feathers are tilted too much, they become a ladder. Ladders are bad. Mackenzie Grove Hager Thank you John Womack and Mark Fields! Very interesting! Paul C. Gilroy We always referred to that as a Venetian blind type tail. Amy L. Rawson Ah, ladder tail, my old enemy. 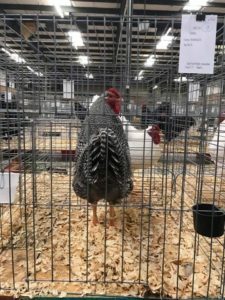 John Hrycek Jr If this cockerel was holding his tail at the proper angle would they still be gapped in the mains? Mark Fields I have found that how they carry the tail doesn’t seem to affect the ladder. Maybe someone has actually studied this, I’m going off what the Voters said and just my personal observation. Brian Decker Loose feather is loose feather whether in the tail or otherwise. Like any other thing one wants to eliminate one would put pressure on the fault. I would want to check both parents. Jonathan Patterson Our LF dark brown leghorns used to get that too. Mark Fields When I had the Light Brahma LF, Bill Bowman gave me quite a lecture about avoiding it. 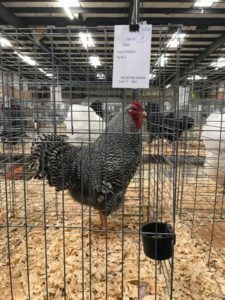 In the case of the male Brahmas we wanted the “stove pipe” whereas in the Dominique we want the “teepee” – either form being reduced in effectiveness when the main tail feathers are slightly offset from the pattern. Here is an almost “perfect” teepee shaped tail on a female Dominique. This picture was taken of Mike Waski’s female at the Indiana show back in the late 1990s.